This is a bottle I bought and opened in May of 2013. I have scored it now 4 times (87, 86, 87, 88). So my average score for this particular bottle is an 87. Again, whenever I score I whisky I always taste it up against 3 others for perspective. Some whiskies I find I score higher or lower based on the selection that night. However, Laphroaig always seems to be consistent for me no matter what I am drinking it next to (be it a boring Glen-something-or-other, a young Kilchoman, an old Ardbeg, or a beautiful Brora). In my book that is quite amazing. Nose: Big earthy peat. Like sticking you head in an earthen peat bog. Lovely. After the earthy peat subsides you get some medicinal notes (antiseptic, gauze, Band-Aids). Now back to lush trees in a damp forest just after the rain, but there is a bonfire burning just over the horizon . . . right by the sea. Dark, green and peaty. This is the least sweet malt in the Laphroaig line . . . and I can get behind that. For once I swear I am getting mango and pineapple? 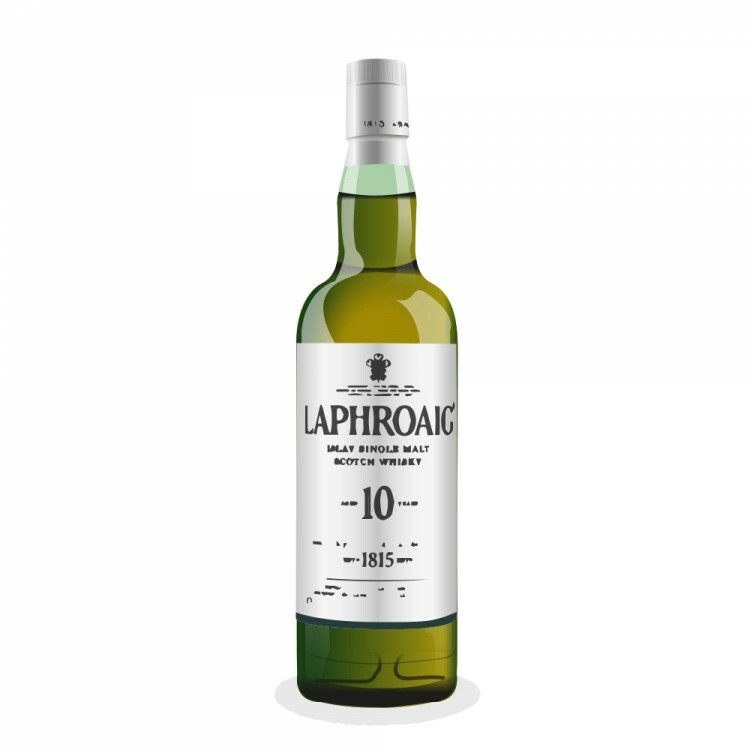 With water more of that sharp mango and pineapple – crazy, this is new smell for me with Laphroaig 10yo . . . (this note only happened on one tasting night). Taste: Nice peat arrival: peat, earth, and muddy wood. This is definitely not sweet like Ardbeg. This is a dry and borderline bitter malt (but NOT bitter). Feels like I am gargling mossy brackish river water. Finish: Big peat blast followed by the long slow intake of breath . . . now the shocking attack of sea salt . . . funny still getting mango (every so subtle). The peat is really the star in this malt with the smoke only emerging here near the end. That peat fire rages for an age and a bit. Yup, getting that brief leftover tropical fruit note at the end. Different . . . I even like it. Balance, Complexity: This is really a wonderful 10yo, and extremely consistent (way more so then Ardbeg 10yo). This guy is never going to achieve the heights that Ardbeg has the potential for, but then it never seems to misstep like the Ardbeg TEN either. It really has these three notes: earthy peat, wood, and medicine. As for balance . . . it is consistent. You would never guess this was older then 10 years . . . sometimes Ardbeg TEN can fool you . . . Aesthetic experience: I love this bottle’s aesthetic, and will be sad when it changes. It has that old 70’s feel to it. Green bottle, white label . . . not the best looking of the big three, but it does it well (prince Charlie puts it over the top with his warrant). I love having this as my everyday bottle. Conclusion: This specific bottle was every bit as consistent as the last several have been. The odd mango note only appeared on one occasion. I never found it again. I leave the note in here because I think it goes to show that some nights your mind and nose tune into certain frequencies. Who knows, maybe that subtle fruity mango note is always there in Laphroaig and I am just not tuned in . . . but I doubt it. More likely I think once your mind fixates on a certain smell (like mago, or match sticks, or bananas) it is really hard to get away from that idea – and so you keep smelling and tasting it. This is why I am skeptical of samples. Because occasionally I get fixated on certain smells that might not always show up when I reach for that bottle again. 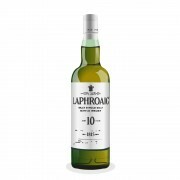 Laphroaig 10yo conclusion: 3 bottles over 3 years with a total of 13 scores ranging from 82-88. I scored it 86 on seven occasions, 87 on three nights, and an 88, 84 and 82 one time each. That leaves an average score of 85.923 for all three bottles (87 for this particular one) Yes, I think I’ll have another. Thanks much for the great Laphroaig reviews today. Your notes are very close to mine, as are your thoughts on 'phroaig vs. Ardbeg. I just happened to buy a new bottle of the 10 today, and it has the new label design. I also have a few well-gassed drams left in a bottle I bought in September of '12, so I'm eager to do a little comparison tasting myself tonight. @Nock, these individual bottle reviews give the true depth and complexity found in whisky. Great work putting out useful information without short-shrifting the complexities of the analysis. Excellent reviews, very in depth and paints an elegant picture to my favorite single malt. @WhiskyBee - thanks for the comments. Would love to hear your comparison notes between the bottles. My guess (and hope) is that there is little change. @Victor - at times I fear my notes are way too long for any normal human to want to read . . . nice to know a few of you are out there willing to wade through my loquacious musings on the minutia of a dram that is, quite simply, just plain good. @GotOak91 - I'm am very pleased that my words paint pictures for you (and don't just encourage skimming). I am very grateful to hear feedback. @Nock - I hope to find the time to write a comparison review later this week. Rest assured, this later (latest?) batch of the 10 doesn't disappoint a bit. If anything, I find it a bit more robust than the bottle I bought last year. Thanks again for the reviews. I don't think I've ever read anything more eloquent, informative, and insightful about this iconic whisky. What a great review, I read it whilst having a dram of the 10yo and it was fun to read along and compare, thank you! Lately I had a sample then I opened a new bottle. The funny thing is that I found more vanilla that I used to find in Laphroaig (which was often close to nothing). What I really like from Laphroaig is the meaty taste that come from the smoke, the fruit and some anise. That is why I love the quarter cask, but this new 10 yo with his vanilla and a peat a bit more woody his making a wink at the Hazelburn CV to me while maintaining his true Islay personality (smoke, medicinal, peat). And as my glass go down, it come back to the old Laphroaig that I love. So I hope you'll buy a bottle in 2014 and let us know what you think of it. I want to make that clear: I still prefer the QC!